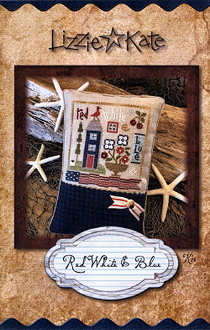 Classic sampler motifs combine with classic L*K charm (and a big, wavy flag!) to create a sweet sampler. Kit includes 32 ct. Lambswool linen, iridescent white beads, deep sea houndstooth wool, vintage-look backing fabric, stripe ribbon, mother of pearl round button, twine for cording AND (whew!) complete finishing instructions. Long may she wave! Kit contains: 32 ct. Lambswool linen, beads, button, fabric, ribbon, twine, complete finishing instructions. Finished design: 4.5" x 4.7" ﻿ with a stitch count of 71W x 74H.